Landscaped gardens provide a great backdrop to the cenotaph, cannons and unusual artworks. Few gardens can claim to be one of the first places in Australia to feature a First World War memorial, and that’s what makes Surrey Gardens unique. Originally designed by William Guilfoyle, (who also designed Melbourne’s Royal Botanic Gardens), and featuring a stone cross and war memorial shrine (also known as a cenotaph), Surrey Gardens has more history in its 1.4ha than any other park in the City of Boroondara. Opened in 1917, Surrey Gardens had a thorough revamp in 2007. It features a rare art nouveau artwork created by one of Melbourne’s pioneering wood carvers, as well as two cannons, affectionately known as ‘Brook’s Babies’ that commemorate the end of the Boer War. These belonged to Arthur ‘Empire’ Brooks and can be seen peering over the garden from the highest point. 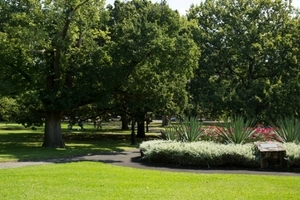 The heritage-listed park is available for hire for weddings, christenings and other events. Booking times: 7 days including public holidays, 8am to sunset. To find out more or make a booking, see hire a park, garden or reserve.